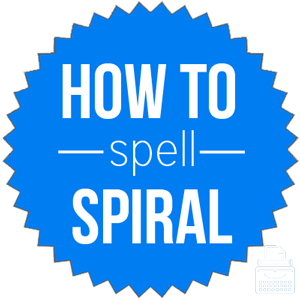 Spelling of Spiral: Spiral is spelled s-p-i-r-a-l. Definition of Spiral: Spiral describes something that winds around a center or pole and gradually recedes from or approaches it; of or relating to the advancement to higher levels through a series of cyclical movements. A spiral is the path of something as it moves around a central point while continuously approaching or receding from it. It may also refer to a single coil or turn in a spiral object. It is also the name of any shape having a spiral form. To spiral means to go and to rise and fall in a spiral course. As a transitive verb, spiral means to form into a spiral or to cause to spiral. Pronunciation of Spiral: Spiral is pronounced spy-rul. What does spiral mean? Spiral can function as a noun, verb, and an adjective. Spiral has multiple meanings as a noun. It is a shape or object with one or more turns about an axis. It may also refer to a path of a point that winds around a central point continuously receding from or approaching it, or, one coil or turn in a spiral-shaped object, or, an object that has a spiral form. The plane maneuvered in a wide spiral above the field full of people. The receiver caught the tight spiral thrown by the quarterback. When used as an adjective, spiral describes something that is of a spiral shape, in that there is a winding around a center point and a gradual approaching or receding from it. It also describes anything that is of or relating to the advancement of higher levels through cyclical movements. As she looked up, she saw a boy holding a spiral notebook stood over her. Spiral is often used as a verb to describe the action of going and rising and falling in a spiral course, to cause (something) to spiral, or to form into a spiral shape. As his behavior started to spiral out of control, his mother no longer knew what to do. Thousands stood and watched as the plane spiraled down to the ground and crashed. Downward spiral: a situation in which some thing(s) gets worse and worse or decreases continuously. Spiral staircase: a set of stairs that winds around a central point. Upward spiral: a situation in which some thing(s) gets better or increases continuously. Spiral was first used as an adjective in 1551, as a noun in 1656, and as a verb in 1834, according to Merriam-Webster’s. This word comes from Medieval Latin spiralis, meaning of a spiral, which comes from Latin’s spira, meaning coil. Spiral can function as a verb, noun, and an adjective. Overall, it refers to an object or action that coils, or moves in series of cyclical turns or is shaped like a spiral, as a helix.